COTE DE TEXAS: Brother, Can You Spare A Dime? Everyone who reads design blogs has probably heard of Pigtown Design – a wonderfully written daily diary by Meg Fairfax Fielding. 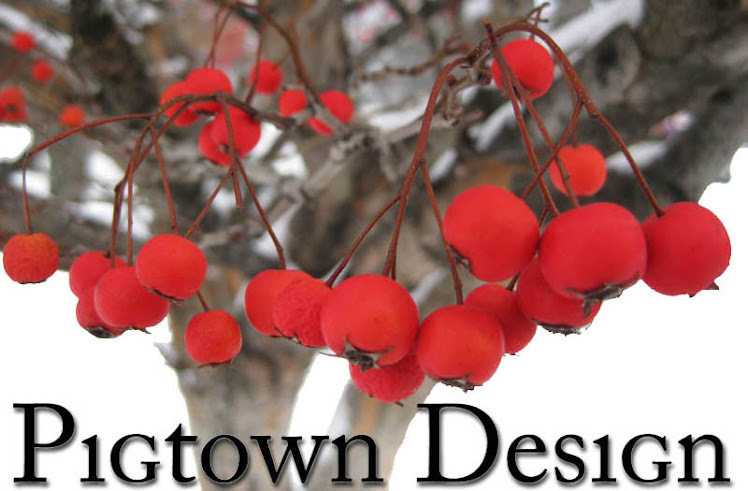 Although Meg’s home base is Baltimore - in the historic Pigtown neighborhood – her blog is a running commentary on any town or country where she finds historic architecture, interesting interior design, antiques or whatever else she finds intriguing. Fielding, whose roots run deep in her town could probably become the Good Will Ambassador of Baltimore, she is such a great supporter and proponent of her city that lies in the shadow of the capitol. And as if keeping up with one blog isn’t enough, Meg is also a foodie and writes a second blog Pigtown Pigout on edible delights. But, there is more to Meg than blogging: in “real life” she works as the Director of Development for the Woodbourne Center. 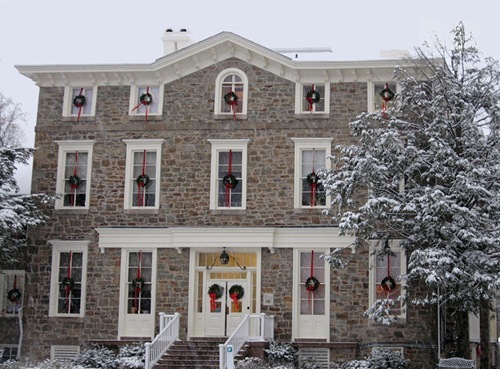 Woodbourne has a fascinating history – one of the oldest charities in America, founded in 1798 – it provides a safe haven and home for children who are abused, neglected, or unwanted. Some children at Woodbourne suffer from mental illness, some suffer from poverty, some suffer from drug abuse – but all suffer. The children’s welfare depends on the generosity of others that keeps Woodbourne operating but, like most charities, this years donations are down – way, way down. Even the state has cut their funding, but more damaging, it is requiring that 2% of last year’s grant be returned! Woodbourne needs your help. Can you spare a dime, a dollar? The Woodbourne Center – once this house is where the orphans actually lived. Today it houses offices for the staff, including Meg who is lucky to have a gorgeous fireplace in hers! This year, some of the children are seen in a video reciting their Christmas List. To watch it, go HERE. It’s heart breaking. Their wishes are so basic - books, pens, pencils, an MP3 player, art supplies, Monopoly, a radio, a sketch pad. One child quotes the bible. Another wishes for joy and happiness, something he says he doesn’t have much of. Oh my. If it doesn’t make you cry……. To hear their simple dreams and hopes is a real eye opener to how so many children have to live their lives in this – the most prosperous nation in the world. “As economic conditions worsen, it is often children who suffer. Their parents are more stressed than ever and their frustration is sometimes taken out on their children, who then act out and get into trouble at home and at school. They are often the unseen casualties in the economic climate. You can make a donation – HERE. I am overwhelmed with your wonderful and kind words about me and the kids I work for. You are such an amazing woman and I am so proud that I can call you a friend. what a wonderful, selfless woman you are. Such a tragedy that this organization sits in the shadow of such waste and disregard for the values this country once held dear. Thanks for posting and bringing this to our attention. I am sending off a check today, in your honor....I don't read Meg's blog, but you know I love yours! Blessings of the season and happy New Year. ps I painted my house and it came out great- Thanks again!!! I just made a donation, it really seems like a worthy cause. Thank you Joni for this wonderful blog that I enjoy so much! You're a good girl, Joni! This is a wonderful cause and thank you for bringing to light! You can even donate through PayPal. No check to write or stamp to lick. Totally fat-free, one size fits all feel-good gift--from you, to you. I too made a contribution..... Thank you for bringing it to our attention. I hope many people will feel generous and donate as well. It is hard to imagine a teenager asking for paper and pencils - when my own children have so much. Very Sad! Thank you all so much! I really appreciate this - I know this is a hard time of the year - and a hard year to give anything. I understand the sacrifice! thank you so much all of you !!! I do hope that maybe some of the wish list might be bought for these kids. but how you buy peace and happiness? Thank you Joni for bringing Meg's devotion to this organization to our eyes. There are always so many needy, important causes to donate to, but it tears at my heart-strings to donate money to children overseas when I know there are those in such need here in our own country, our own back-yards. The video was very difficult to watch. Breaks a mothers heart. Joni and Meg...cheers to you both. I made my contribution in both of your names. Now that was a real holiday rush. Thank you so much for bringing us this story of need, sacrifice & hope. My children are making a donation in their school's name. That is the holiday spirit! I crumbled when I listened to the video. Their wants are so simple. And you know there will be enormous gratitude if those wants are fulfilled. Thank you for letting us know about this. Donation done. Thank you for binging this story to us. I was once in an orphanage and wish it had been a place like Woodbourne with people like Meg. So this story gave me an opportunity to help make things right for today's children. I have given on line through paypall. And Meg, bless you for all that you do for children. They will draw strength and courage for the rest of their lives from the good done for them today. Their wants are so simple. And you know there will be enormous gratitude if those wants are fulfilled. Thank you for highlighting this. SO important to realize there are those of us in such need... and I had no idea about this facet of Meg! and Maryland requiring 2% back!? Ashamed of my former state! Joni, a very thoughtful post for Meg and the children. Meg really cares about Baltimore, her roots, and her work. Tis the season to give! I haven't even watched the video yet, and I am crying. As an adult abused child, Thank you for all you do and Thank you Joni for letting us know about this. And, I can not believe that they are being forced to give a percentage of last year's grants back! That is horrid. God bless them each and every one! I try very hard to show my children what Christmas really means. Every season we adopt a family, pack up clothes and toys to drop off at the domestic violence shelter and every time we see a red bucket we drop in all of our change and then some. The other day we were entering the mall with several other shoppers and my son loudly said, "Mom, why were we the only ones giving? If they are coming here to shop I bet they could have given a dollar." Its hard to shush such brilliant reason. Why don't more people give? Thank you Joni for encouraging others to be selfless. It truly is the very best give to give and what you receive is far greater. Thanks so much for sharing your compassion. In a season in which we are often caught thinking about adding to our own already full coffers, it's so important to remember and give to those who have less. Donation on its way to Woodbourne.